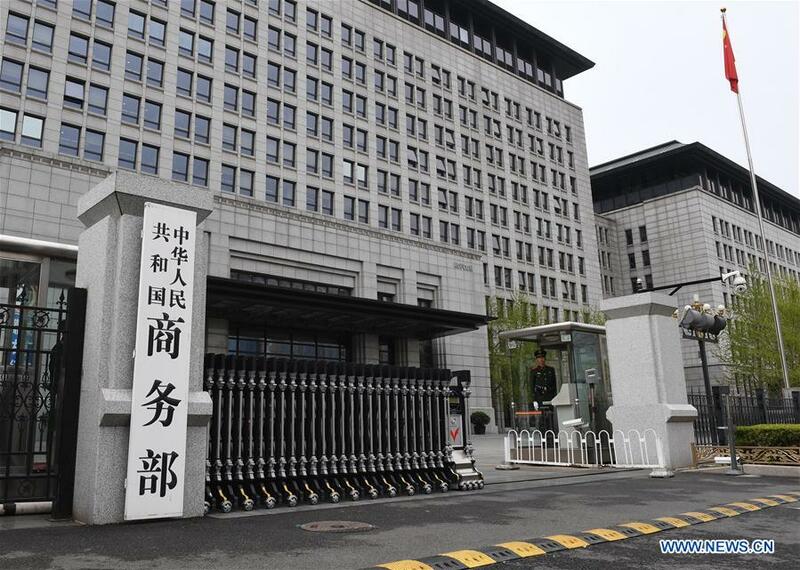 BEIJING, April 4 (Xinhua) -- China strongly condemns and firmly opposes the United States tariff proposals and is ready to take countermeasures on U.S. products, the Ministry of Commerce (MOC) said Wednesday. A MOC spokesperson made the statement after the U.S. administration announced a proposed list of products subject to additional tariffs, which covers Chinese exports worth 50 billion U.S. dollars with a suggested tariff rate of 25 percent. "Disregarding strong representations by China, the United States announced the tariff proposals that are completely unfounded, a typical unilateralist and protectionist practice that China strongly condemns and firmly opposes," according to the statement. The proposed list covers approximately 1,300 products imported from China, including industries such as aerospace, information and communication technology, robotics, and machinery, the Office of U.S. Trade Representative (USTR) said in a statement. The U.S. side published the list in disregard of the mutually-beneficial and win-win nature of the China-U.S. commercial cooperation in the past 40 years, the appeal of the Chinese and American business communities and the interests of consumers, it said. China plans to immediately bring relevant U.S. practice to the dispute settlement body of the WTO, and is ready to take countermeasures on U.S. products with equal force and scale that will be published in the coming days. "We have the confidence and ability to respond to any U.S. trade protectionist measures," the MOC spokesperson said. Chinese Foreign Ministry spokesman Lu Kang also made a response Wednesday, saying the U.S. tariff proposals are "a typical unilateralist and protectionist action." "We hope that the U.S. side, with sense and long-term picture in mind, refrain from going further down the wrong path," the Chinese Embassy in the United States said in a statement on Wednesday. The memorandum is based on a so-called Section 301 investigation, launched by the Trump administration in August 2017, into alleged Chinese intellectual property and technology transfer practices.